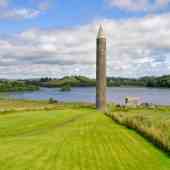 County Fermanagh pictures of Ireland a small selection and then read about them below. Lough Erne, Enniskillen, Marble Arch Caves. If you are planning on visiting Ireland and want to stay in this area then you can have a look at premier inn and places to stay which gives lots of useful choices on different types of accomodation. 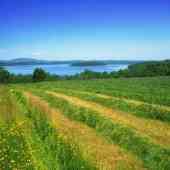 So with that said here are some pictures of Ireland from County Fermanagh and a short description of them. The first photo of Ireland from County Fermanagh is one of Lough Erne or Loch Erne. This is the name of two connected lakes in County Fermanagh, northern Ireland. Quite simply it is known for its sheer natural beauty. The river itself begins by flowing north, and then curves west into the Atlantic . The southern lake is further up the river and so is named Upper Lough Erne. The northern lake is Lower Lough Erne and is the bigger of the two. 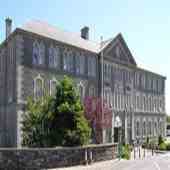 The County town of Enniskillen lies on the short stretch of river between the lakes. The lake has 154 islands along with many coves and inlets. Lower Lough Erne, runs for 26 miles almost to the Atlantic. When the wind blows it can be something of a challenge with waves of open-sea dimensions. Islands in the lower lough Erne include Boa Island, Cleenishmeen Island, Crevinishaughy Island, Cruninish Island, Devenish Island, Ely Island, Goat Island, Horse Island, Inish Doney, Inish Fovar, Inish Lougher, Inish More, Inishmacsaint, Inishmakill, Lustybeg Island, Lustymore Island and White Island. Those in the upper lake include Bleanish Island, Dernish Island, Inishcorkish, Inishcrevan, Inishfendra, Inishleague, Inishlught, Inishturk, Killygowan Island, Naan Island and Trannish. Several of the islands are privately owned, and occasionally come on to the open market. In 2007 Inishturk went on the market at the price of £695,000. In 2012 Inisliroo went on the market at the price of £600,000. Locals will say worth way more than that ! The second picture of Ireland from County Fermanagh is Monea Castle and is a splendid example of the so-called "plantation castles" built by settlers. It is one of the finest "plantation castles" in (albeit ruined) existence. If you are interested in castles, it will be well worth your time to head to Monea castle-the entrance to Monea castle is beautiful too with the alley of trees to guide you in. Florence Court is an idyllic National Trust house and estate set against the stunning backdrop of the Cuilcagh Mountains. As the home of the Earls of Enniskillen, Florence Court was, and still is, one of the most important houses in Ulster. Now, with many original contents displayed in the house, it has retained all its Georgian glory. The house tour includes the exquisite rococo decoration, fine Irish furniture and service quarters. 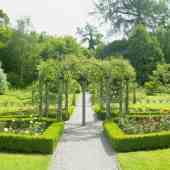 There are extensive walks in the beautiful gardens and landscaped grounds, also a sawmill, charming holiday cottage and walled garden. 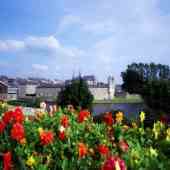 This is a picture of Enniskillen Castle. It is situated beside the River Erne in County Fermanagh and as you can see is a beautiful setting and surrounded by walks. It was built almost 600 years ago by Gaelic Maguires. The next of the northern Ireland pictures is from Belleek, a little village in County Fermanagh that not many people may know about- except perhaps those people who are keen on Belleek china!!! Belleek Pottery is world famous for its Parian China. When you step into it you step into one of Northern Ireland's most fascinating attractions. It is one of Ireland's most popular tourist attractions where you can enjoy its tearooms, museum and audio visual and of course buy some beautiful pottery. This is probably the most important of Lough Erne’s many island church settlements. 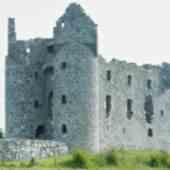 Devenish was founded in the sixth century by Saint Molaise. You can admire the beautifully carved, intricate details with figures and sculptures and climb the round tower. The round tower stands at 30 metres (100ft) tall– internal ladders will help you inside the tower. Climb to the top and marvel at the spectacular views ! So these are just a sample of Irish images of northern Ireland and ides on places to visit in Ireland -there are lots more -add your own Fermanagh pictures of Ireland places below with a few lines of what makes the photo special to you. Do you have a picture that captures a special moment or a unique undiscovered place in County Fermanagh?